A radio documentary about the survivors of the Mary Magdalene Home Laundry in Galway (broadcast 1992). 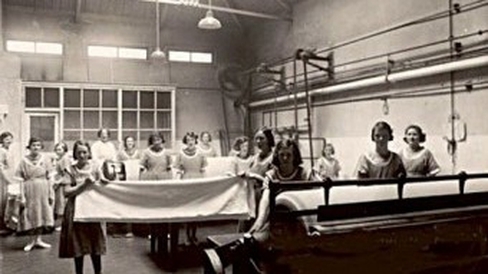 Single women who became pregnant and women who were unwanted by their families for other reasons were sent to the Mary Magdelene Home Laundry in Galway. Some spent the remainder of their lives there. The MacAleese Report of February 2013 found that the Sisters of Mercy, Galway, open from1943 to 1971, brought in an average of £31,681 each year – the equivalent of €815,774 in today’s money. Once expenses were taken into account, the laundry ran a net surplus of just under €50,000. It found that the Sisters of Mercy continued to care for 18 women in the home after the closure of the laundry in 1984 for the remainder of their lives. A Prime Time programme broadcast in September 2012 stated that the Galway laundry had made a profit of more than €1 million in today’s money, but the accountants said this was “plainly mistaken”, noting that the programme only looked at money that came in but did not look at the expenses. This documentary includes descriptions of the conditions there and includes contributions from Anna Mae Gill, Bridie Hackett, Richard Hacket, Seamus Rutledge and Patricia Burke Brogan who has written a play called 'Eclipsed' about the laundry set in 1963. First broadcast 14th November 1992.